Posted on February 16, 2011 October 16, 2016 , in Multilift Hooklift. Multilift hooklifts have long been a part of the Atlas Polar product line-up. Today, I’d like to highlight one of the newer models. The XR14 hooklift is designed for 2-axle 19 GVW trucks. It comes in 5 different models, each with a lifting capacity of 14 tons. Yet the weight for each of the various models ranges from only 1600 kg to 1840 kg. 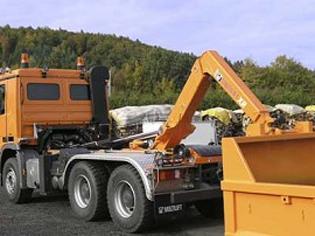 Its light weight, relative to its lifting capacity, allows for more cargo on the truck. The XR14 also provides several options that can be chosen independently, allowing for customization of the hooklift. These options include automatic sequence control, fast tipping, friction relief (to eliminate friction when changing body types), and fast speed. Standard features include high-quality top-coat painting. This model of hooklift also includes Multilift’s Programmable Logic Controller (PLC). To learn more about the XR14 hooklift, download the technical specs in the attached brochure. For information on the other models of hooklift available from Atlas Polar, visit our Multilift hooklift systems page.